In Empire Express, players create competing railroad empires by drawing railroad tracks with crayons upon an erasable board. You win if you utilize your network of rail lines to acquire and deliver goods efficiently to accumulate the largest personal fortune! The base game provides pre-programed routes on a board depicting a north eastern portion of the US with demand cards providing players with an easy way to learn the system through play. Players start with the bare bones of a railroad: an empty train and track connecting some cities. Each turn you and your fellow players take turns building track, operating trains, and delivering loads. The bank will pay you for each delivered load. With the starting route guided by the board, only two loads per card and a visual pick-up and delivery guide on every card the learning curve is greatly shortened. 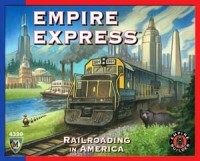 Empire Express is a light version of the choo choos and crayons version of train games. It is good for both beginners and veterans alike. For veteran train gamers looking for a very fast fun game, this is it. My game group can play an entire game of this in less then 25 minutes. For those who are just starting out in train games, this version streamlines the winning conditions, and starts the players out with a set amount of track and specific loads. Which takes the initial overload of learning the rules out. Players are introduced to movement and loads, and then once they are comfortable with that, the game picks up and starts adding in the rest of the strategies. Add a Review for "Empire Express"